Accreditation and the Dade County Association of Academic Non-Public Schools. Beacon Hill students may be dropped off at school from 6:30 a.m. and picked up by 6:00 p.m. at no additional charge. Our school day begins at 8:30 a.m. and ends at 3:15 p.m.
eacon Hill School is an independent, traditional, all-faith, coeducational school incorporating preschool through grade eight in Hollywood, Florida. Founded by Irving and Cherie Liss in 1959, Beacon Hill School continues to be run by the Liss family under the leadership of Executive Director Andrew Liss. 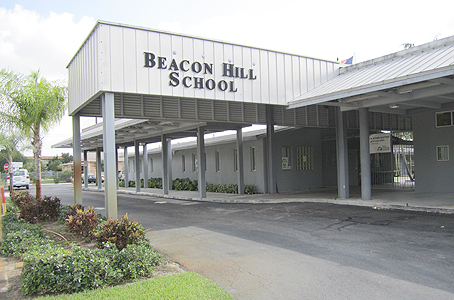 Beacon Hill School is accredited by the Southern Association of Colleges and Schools, the Association of Independent Schools of Florida, and the Commission on International and Trans-Regional Accreditation and is a member of the National Council for Private School Accreditation and the Broward County Non Public School Association. Small Classes in Beautiful, State-of-the-Art Facilities! Large, bright rooms designed to encourage creative learning. All students from Kindergarten through Ninth Grade enter our exclusive internet-based technology program in our state-ofthe- art Computer Lab. We also have a fully equipped Science Laboratory. Foreign Language is required for all students. Badge Our program will challenge your child to the fullest and reward your child with a high quality learning experience. Beacon Hill’s Honors Program is designed to promote a rigorous academic experience for talented, intellectually curious, ambitious, and motivated Teacher and Boy students. Honors courses emphasize critical thinking, intensive analytical writing, speaking, the use of primary source material, and information literacy and research skills. Some scholarships available. The school is comprised of three departments: The Early Childhood Department, the Elementary, and Middle School.